There is cuteness and a lot happening relationship wise. Ai Xing is ready to move forward with Tian Ze as she finds herself falling for him and him for her, but Jing Jing refuses to move on from the past and everyone around her suffers for it. The girl needs to learn to let go. She has made her decisions and she needs to live with them now instead of regretting them. I must say that I like this drunk Jing Jing better than the previous one who got drunk in order to say rude things to Tian Ze and Ai Xing so that she can break up with him. She’s really funny and outrageous. Ren Wei seems to like this side of her. Or, should we say he’s enjoying her not hating him for the moment. Jing Jing runs off to chase after the moon and ends up throwing her shoes into a garden. She makes Ren Wei go and get them (they are shooting stars for him to make a wish on). Ren Wei obliges (though he really didn’t want to go through the garden) and brings them back. He then piggybacks the drunken girl to his car only to recall he left his keys at the restaurant in order to rush after his drunken fiancée. Whoops. He then calls for a tow and is stuck in that parking lot for another two hours. I don’t think Ren Wei minds as he is happy just being with the sleeping girl who is using his lap as her pillow. He even tries to keep the glare from the streetlamp out of her eyes so she can sleep in peace. Awww. Who knew that Ren Wei had such a softy and fuzzy side to him? Ai Xing is teaching her brother and Tian Ze how to read while Grandpa looks at naught magazines. This catches the boys’ attention and they go over their. Grandpa tells Ai Xing that he doesn’t want Tian Ze’s member to forget as well as he still wants great grandchildren. He then goes to show his grandson how to put the moves on his girlfriend. Ai Xing does not like this as she’s very uncomfortable with the amorous kid that is Tian Ze. So she is happy when Zhi Xing comes out to complain that his drawing pencils have run out. Grandpa is so funny. Poor Zhi Xing became his guinea pig so he can teach Tian Ze how to kiss. LOL. Ah. I shall miss Grandpa when all is said and done. I loved his appearance as the boss in Skip Beat! as well. Actually, I don’t think there’s a role of that actor’s that I haven’t liked. Ren Wei calls in his love coach to ask advice. He has Jing Jing’s dirty and tattered shoes from the previous night. He’d like to buy her new ones. Hell, he’ll buy her an entire store of shoes. Ling Li says that even if money isn’t a problem, it is. Basically meaning that sure he has the money to buy her tons of designer shoes, but what will touch Jing Jing’s heart more is sincerity. Plus, we learn that these are limited edition shoes that are hard to get. Ren Wei doesn’t get it. Hell, I’m a girl and I don’t get it. Maybe because unlike some women, I could care less about shoes. This might be due to the fact that I have such trouble finding shoes that actually fit my feet right. Anywho. Ren Wei must learn sincerity. I think he gets it to an extent, but he doesn’t understand 100% of what Ling Li is saying. But Ren Wei goes out in search of the exact same shoes as the ones Jing Jing soiled. Since it is a limited item, he has no luck and has to go from store to store. Ai Xing takes Zhi Xing to a bookstore and tells him to pick out whatever he wants for his art supplies. 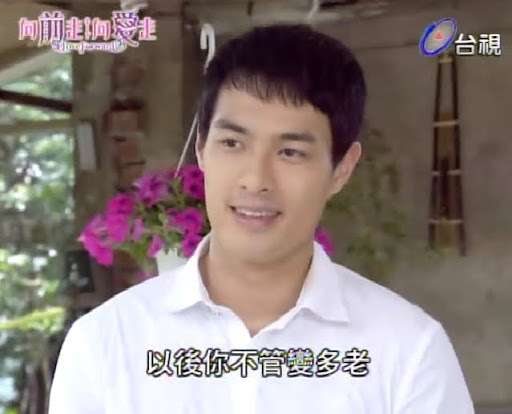 Zhi Xing says he wants everything and Ai Xing has to refuse because she is poor. Seeing his crestfallen face, Ai Xing says that she will do her best to get what he wants. She notices Tian Ze and takes him to get practice books for writing. He wonders off and she starts freaking out. He doesn’t know his way back to Grandpa’s nor does he know Ai Xing’s phone number. She finally finds him as Zhi Xing decides on a book he wants and gets up to find her. Ai Xing scolds Tian Ze for making her worry, and Tian Ze apologizes. He just wanted to get a certain book about saving money as he knows Ai Xing is very frugal. Before Ai Xing can say anything, Zhi Xing starts yelling for her. Ai Xing and Tian Ze rush over and learn that Zhi Xing started following a girl who looked like Ai Xing out of the store in order to stop her and get her to buy the book for him. The clerk mistakes him for a thief. Ai Xing insists that Zhi Xing would never steal, but he woman insists that the police be brought in. For one little book? Zhi Xing begs Tian Ze ge ge for help and Tian Ze then starts spouting off the law in regards to those who are handicapped. Even if the police were called, they can’t do anything as Zhi Xing is mentally disabled, thus the boy is saved. I mean, I understand not wanting to let shoplifters go, but Ai Xing promised to pay for the book, so why were they still going to bring in the cops? The trio get back home and Ai Xing takes out Tian Ze’s law book and begins quizzing him. He remembers it all! Ai Xing is amazed at how the dissociative amnesia works. He couldn’t remember how to talk, walk, or write at first, but he can still remember all the laws and meanings. Grandpa comes home and Ai Xing tells him about Tian Ze’s memory. Tian Ze then learns that his father is also a lawyer. Ai Xing then decides to spin her own lies when Tian Ze asks how his father is. Ai Xing says that father and son are a lot a like (and they are), but she then says that the three Du men have a wonderful, loving relationship. Say what? Grandpa doesn’t wish to acknowledge this, but eventually he goes with the flow and says that their relationship is all great. LOL. Nice going Ai Xing. She has always been trying to fix the rift between them. Maybe now’s the time. Later, Zhi Xing looks through the book that Ai Xing bought for him happily. Ai Xing comes in and says that someday she will get a gallery and display all of her brother’s artwork. This makes Zhi Xing happy. Ai Xing then gives him a nice new drawing bad so he can put all his sketches in their instead of loose-leap scrap paper. Ai Xing later goes outside and Grandpa comes out wondering why she looks so mopey. Ai Xing asks after her brother’s collection of drawings, but Grandpa doesn’t know where they are either. Ai Xing then explains she just realized that while she proclaims to love her brother and others, she never really thought about what he wants and what his dreams are. This makes her feel badly as someone finally noticed and took an interest in what she liked (referring to Tian Ze wanting to buy her a book on saving money). This makes Grandpa feel like he’s wronged his adopted grandson as well. All he’s done is fed him and housed him. Ai Xing says that was plenty and that they love him. Grandpa says that all three of them are his grandchildren and he loves them all, too. It’s a touching family scene really. After Grandpa goes to bed, Tian Ze comes out and asks Ai Xing to go stargazing with him. She doesn’t really want to, but she does end up going. When she complains about the neck strain from staring up at the night sky while walking, Tian Ze puts his hand behind her neck. Awwww. He then asks Ai Xing to sing for him as he has a memory of someone singing to him. Ai Xing sings the mandarin version of “Twinkle Twinkle Little Star” and unhappily thinks about how it was probably Jing Jing. This makes her feel guilty to both Tian Ze and Jing Jing. She then gets Tian Ze singing and dancing with her. So cute. they then go and sit on the docks. Ai Xing leans on him and when he asks about the constellations, she names them after Doraemon characters and has Tian Ze repeat them. She then falls asleep and Tian Ze doesn’t move in fear of waking her up. Meanwhile, Poor Ling Li is buried in work thanks to Ai Xing’s absence and Ren Wei’s pursuit of his love. After losing a whole night’s worth of sleep yet again, Ling Li has reached her limit. She calls Ai Xing. Tian Ze tries to wake her up, but she keeps sleeping. So he takes out her phone and puts it up to her ear so she can hear Ling Li scream at her to get into work OR ELSE. Teehee. I really do feel bad for Ling Li. She’s super efficient and organized, but when two people bail (and one of them is very important), it really can be hard to keep up with everything. Back at the Du house, Grandpa is tired and annoyed. He stayed up all night waiting for them and they didn’t come home. There’s a limit, you know. Some things just shouldn’t be done. Ai Xing and Tian Ze make it back home with Grandpa’s favorite buns from his first love. This makes the tired man let the kids off. Het hen tells Ai Xing to go back to Taipei so she can put her money in her piggies to save up and buy the house for them all to live in like she dreams of. Grandpa also tells Tian Ze to be good to Ai Xing as she has taken care of them for so long now. Ai Xing gets all emotional and hugs and kisses Grandpa. Tian Ze is surprised to see the extent of Ai Xing’s filial duties to his grandfather and he vows to help her with her dreams. It’s really sweet. Ai Xing gets to work and Ling Li tasks her with getting documents to Ren Wei to sign or else she’s fired. As Ai Xing runs out, Ling Li also reminds her that all her other work duties and the Mei Ze duties need to be handled as well. Ai Xing searches desperately for Ren Wei who is on his 10th shoe store. He finally finds the shoes in the right size, but they are the last ones and they have already been reserved for a customer. Ren, who actually isn’t being rude and pushy, says he will wait for as long as it takes for the customer to arrive so he can see if he couldn’t possible buy the shoes off of her for Jing Jing. Aww. I guess he does understand sincerity. Given the valuableness of the shoes, he knows how much Jing Jing must have wanted them and is determined to give her what she wants most. Really, sweet. After waiting all day in the sun and rain, Ren is notified that the customer is almost to the store. It turns out the customer is Jing Jing! Now, let’s pause for a moment and consider this: How is Jing Jing getting the money to replace special edition designer shoes (and paying in cash no less)? I mean, they have no money and it’s not like Ren Wei has her on an allowance yet, so what the heck? I found this to be really annoying. Anywho, what fate these two have! Ren Wei happily says he was trying his hardest to get the shoes for her. Jing Jing initially was going to insist on paying but has his card charged instead. She then takes the shoes out and throws them into the road in the pouring rain. Poor Ren. He gives his smile and laugh and goes into the road to fetch them. He’s almost hit by two cars. That shocked Jing Jing. Looks like she thinks he was just flaunting his money. Shakes head. Did she not see his puppy dog happiness at knowing that he finally found her beloved shoes? He so wasn’t super-gloating Ren Wei. When Ren Wei comes back she yells at him for almost getting killed and then tells him she’ll never accept anything from him. Ren Wei then says there will come a day she will. The shoes get thrown to the ground again. Poor guy. The confuzzled and hurt Ren Wei ends up running into Ai Xing and he takes out his frustration on her by planting a kiss on her. 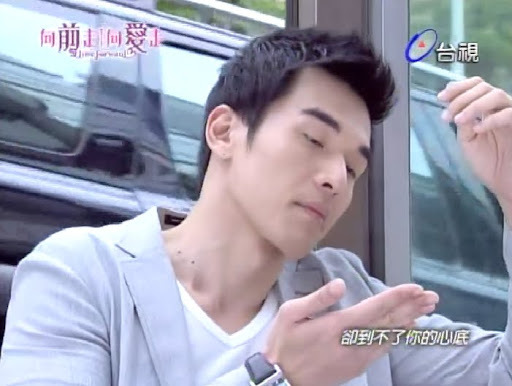 Ai Xing pushes him away and slaps him. Why did he do that? Ren Wei explains that he’s been hurt in love and so has she, so why can’t the seek comfort from each other? Ai Xing wonders how she’s been hurt and Ren Wei says she’s just a stand-in for Jing Jing. Ouch. Now that really hurt Ai Xing. She tears up and says even so, Ren Wei can’t kiss her in Jing Jing’s place. She then stalks off and collapses on a set of stairs and cries as she realizes that was her first kiss. Besides Ren Wei doing it out of frustration and hurt, I think he did it because at that moment Ai Xing showed him genuine concern while Jing Jing had shown him only contempt earlier. But even if that is the case, poor Ai Xing has become everyone’s dump truck. All their problems and worries are dumped or forced on her. Poor, poor girl. Ren Wei goes back to his office all mad. This time I think it’s at himself and not just Jing Jing. He tosses all her reminders to the floor. Reminders? The money she gave him to pay for his drink, her shoes, the phone case she threw into the street, and the umbrella that she rejected. Man, this guy has it really bad. However, he comes to his senses and uncrumples the precious NT500 bill, and picks it all up. Jing Jing, please put this man out of his misery. Show him some love since you already agreed to marry him. Oh, and she promised to give him her heart if he postponed the wedding. I don’t even see her allowing him into her heart even an inch. The girl needs to learn to try, to work, instead of being all Ms. Sour Grapes because she feels she’s entitled to be. Ai Xing comes back to the apartment and is surprised to find Tian Ze there. Apparently Grandpa sent him so he wouldn’t be lonely without Ai Xing. Tian Ze is all worried that she’s been crying. Ai Xing waves it off and then wonders why it couldn’t be Tian Ze who kissed her instead. Tian Ze doesn’t seem to pick up exactly on what she said and just thinks Ai Xing wishes to kiss. Nope, not at all. LOL. TIan Ze then tries practicing kissing on the female piggybank. Ai Xing catches him and takes the male one. Kissing isn’t what is important, the feelings are what matters most. Still, Tian Ze wishes to kiss her. Ai Xing goes up at the last moment and kisses his forehead. Tian Ze reciprocates with a sneak attack on her cheek. LOVING IT! That night Ai Xing writes in her diary and tries to sort out what happened. What is love? What is a kiss? Does Ren Wei like her? Will Tian Ze still like her when he gets his memory back? No matter what, she feels guilty towards Jing Jing. Poor Ai Xing. She shouldn’t have to. Meanwhile, Jing Jing is wondering about love herself. Why is she so hung up on Tian Ze? Is he because of who he is or because he’s her first love? And what about Ren Wei? Can feelings really change that face? She just doesn’t know. Looks like Jing Jing is questioning this because she might be starting to really like Ren Wei, but if you see what happens in the next episode, the promise here falls really flat. I was just thinking that the apt title of this episode should have been “What is Love?” This might be because I’ve been cyber stalking EXO-M again. Sure, EXO-K is good as well, but I really, really, really like M. So, “gaosu wo, what is love?” Oh, and then you have that great line: “I’ve lost my mind.” See? It really suits this show. Oh, and episode 20? Some really great family moments between the Du men. And some rather preachy and obvious storylines. I guess this drama just can’t escape its pitfalls. This was such a good episode, I’m so happy to go through it again by reading your recap! Haha it seems like this is the only time I’ve liked Jing Jing lately…when she was drunk. When she’s sober, it’s a whole different story. She still views her relationship with Ren Wei as a power struggle..it’s so frustrating to see her crush Ren Wei’s heart over and over. At first I thought the Ren Wei-kiss scene was a bit abrupt but now I like it A LOT. The kiss itself wasn’t that great but the way Ren Wei looked at Ai Xing before the kiss was so heartbreaking. I think they should’ve had a voiceover narration (while Ai Xing is trying to help Ren Wei) with Ren Wei saying something like “Why are you always like this?” or “Why couldn’t you be the one for me?” <<because I totally want Ren Wei to fall for Ai Xing! It’s pretty sad when you can honestly says that you like a character drunk better than when they are sober. It makes me want to have more of a drunk Jing Jing because then she seems so much better. It’s funny because you never know just what kind of drunk scenes you will get. I’m really glad they didn’t do the woe is me, sappy drunk pity party. I wouldn’t have been able to stand that. I also wish Jing Jing would get it out of her head that her relationship with Ren Wei IS a power struggle when it is obviously anything but. Poor Ren Wei tried so hard to keep his good humor, but his wittle heart was sliced into ribbons. I mean, WHY couldn’t Jing Jing see how happy he was to buy her the shoes she loved. WHY? If it was a power thing, he’d have that cocky, better-than-you grin. Instead, he had this beautiful, natural, happy smile. The kiss surprised me, but then seemed so much like little kid Ren Wei who just doesn’t know what to do with his emotions. Here is this girl that he opened up himself to. He told Ai Xing more about himself than anyone – even Jing Jing or Ling Li (tho Ling Li is a pretty good guesser). Even after all that has happened between him and Ai Xing, here is this girl who still worries about him. I can so hear him wondering sadly why she wasn’t the one. That happens so often in these dramas. Usually with the 2nd male lead hearing it from the leading lady. I think it would serve Jing Jing right if Ren Wei could fall for Ai Xing, but I almost get this brotherly-family feeling from their relationship now. I know I feel a bit bad for saying that but..IT’S TRUE. However I did like Jing Jing in the past better than how she is right now. You know, back when she was daring and spunky and super smart? AHHHHHHHHH REN WEI’S SMILES!!!!!! *swoons* Hmm I guess I get the sort of camaraderie feel from Ren Wei, Ai Xing, and Ling Li’s relationship. It’s like the feeling you get when you see former-enemies who are now good friends.